While there were plenty of plays to choose from that showed just how dominant Lillard was against his opponents, none of them were quite as good as this buzzer-beater that he shot over former Trail Blazer Raymond Felton to end the third quarter. There are two big reasons why this play sticks out. 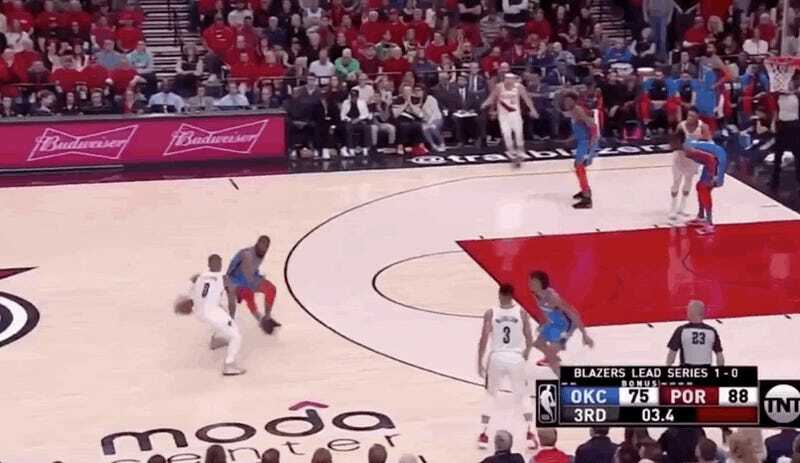 First, Lillard’s handles in this play scream, “I can do whatever I want, and you can’t stop me,” which is a sentiment that is proven correct almost immediately with his shot. Second, it provides a fun reminder of how much better Portland has gotten as a team over the past decade. Nothing says growth like the current franchise superstar roasting the hell out of the old hunk of meat who used to play that star’s position, and is now unsuccessfully trying to defend him. C.J. McCollum On The Trail Blazers&apos; Playoff Woes: "Im Trying Jennifer"